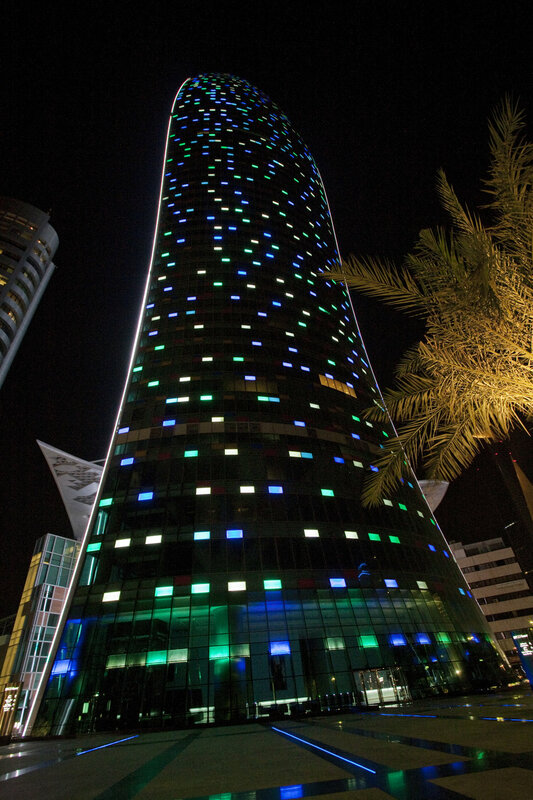 Awards: Light Middle East Awards 2014: Winner of Innovative Lighting Project Of The Year. The facade features coloured panels set in the architecture with random coloured glazing to the spandrel panels. KSLD integrated LED lighting into the spandrel glazing, providing a random arrangement of single colour elements. The themes chosen to animate these are: ‘waterfall’, which presents a gentle cascade in green and blue colours; and ‘diamond’ which animates all colours with a white sparkle provided by random strobing of white panels. In the course of programming, the client requested additional themes and we created a snowfall effect, playing digitally generated snow across white and pale blue elements over a solid blue ground; and a Kuwait flag, with edge lighting in the flag colours of red, white and green, and a red and white animation over a green ground. Working with the limited colour arrangement creates a dramatically different result than the typical RGB colour changing system, giving us a far greater range of brightness and a much more interesting challenge in developing dynamics and patterns. We used a combination of digital video, effects generation within the E-Cue control system and mechanically derived animation to achieve the effects. 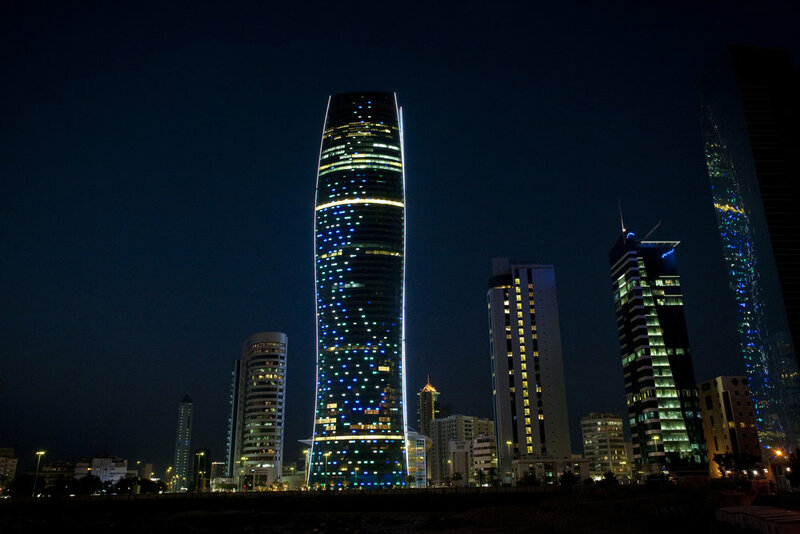 The tower stands out powerfully among the other lit towers; the edge lighting defines the curvaceous form and the animations read clearly against the sky and background of lit buildings around the site.